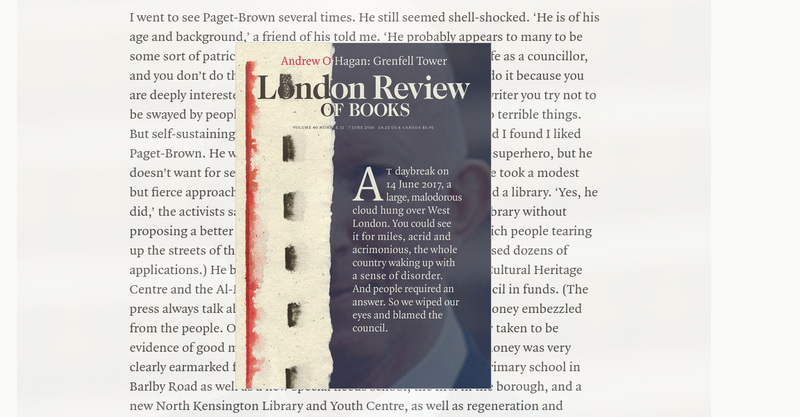 The Friends of North Kensington Library (FNKL) write to object to Andrew O’Hagan’s extended essay The Tower, for its woeful misrepresentation of the case of North Kensington Library. You will already be aware of some objections to the work, which has caused great distress to our community. In relation to this, we would like the LRB to note that we found having to rehearse this argument in the weeks where the commemoration hearings for the Inquiry were running an unforgivable burden, which we expect the LRB to account for in full. We cannot help but stagger at the timing. The LRB of course is at liberty to print whatever it likes. However, we strongly object to the suggestion that The Tower is a work of ‘investigative journalism’. We can state unequivocally that O’Hagan made no serious attempt to research the issue of North Kensington Library, which he uses to substantiate his claim that activism in our area before the fire was a practice of a few febrile neurotics. He did not speak to anyone from FNKL, nor did he attempt to contact our group. We can only assume that he cannot not have read many of the still publicly available material on the campaign, because his account of it is laughably inaccurate. We can only really speak for our campaign here, but the LRB should note and challenge O’Hagan on the fact that he made no attempt to speak to any of us at FNKL – still an active group with a public presence and numerous possible ways to contact us. If this is the standard of investigation across the piece, then that would go some way to explaining the numerous egregious errors and misrepresentations that you should rightfully be striving to correct. Further, O’Hagan’s lack of critical thinking in relation to some of his sources – specifically RBKC Councillors – and his failure fully to investigate the political environment that prefigured the fire, means that he fails to grasp the social dynamics or the political environment in which the fire happened. We read the woefully under-researched description of the campaign to save North Kensington Library Building for public use with a weary sense of familiarity; it is the exact story of our campaign presented by the Council at the time, and one which we spent much time trying to correct through correspondence, letters to local newspapers, and engagements directly with Councillors and the community – most of which are still publicly available. Of course, had O’Hagan made any attempt at all to discuss the library campaign with someone from our group, we would happily have corrected his misconceptions, which include the fact that the children’s library is accessed by a ramp so there is no need for his sarcastically framed concern for ‘mothers [sic] bumping their buggies up the stairs of the old library’. However, the principle and most damning misrepresentation here is that we ‘activists’ mindlessly campaigned against the closure of NKL, which was never proposed by the Council. In point of fact, the campaign that the FNKL conducted was always centred on keeping the historically important building at 108 Ladbroke Grove, one of the first purpose-built public libraries in the country, in public use. Again, this is publicly available knowledge, so it is surprising to see that O’Hagan has missed this. Of course, FNKL are unable to state with certainty whether these inaccuracies about the library and the library campaign are due to poor research, or the wilful oversight of facts that do not support O’Hagan’s arguments. However, what is abundantly clear is that O’Hagan has depended too readily on Nick Paget-Brown for his understanding of the campaign, allowing, consciously or not, his article to become a PR piece for Paget-Brown, with whom it is clear that he has spent considerable time while writing this piece. Neither the poor research or wilful misrepresentation explanation covers O’Hagan or the LRB in glory. But in either case, the persistent misrepresentation that campaigners were opposed to a library closure is a fiction authored primarily by Nick Paget-Brown, then leader of the Council, and one that he engineered during the campaign to avoid having to deal with the questions about process, democracy, and the loss of public space with which our campaign was concerned. See, for example, Paget-Brown’s blog entry for May 2016i, in which he attributes a number of arguments to campaigners that bear no resemblance to the campaign’s publicly available and widely disseminated demands. Readers will note that on that still publicly-available blog, members of the public attempted to engage Paget-Brown, without success, on the actual substance of the complaints that campaigners were raising. The campaign at that time called, by means of public petition - accessible to both Paget-Brown at the time and Andrew O’Hagan contemporaneously - to keep North Kensington Library Building in public use; asked that Paget-Brown as Council Leader attend a public meeting to discuss the decision making process; suggested a public consultation on the future of the building, were it not possible to keep it as a library; asked for some of the now famous cash reserves of the Council be used to preserve the historically important building for public use; challenged the Council’s application of the law pertaining to the sale of public property. The demands were modest, acknowledged that library services might need to be relocated in the financial climate, asked only for consultation, and questioned how the Council valued public assets. Having gathered more than 1,500 signatures the petition was presented to a full Council meeting. This means that this was a petition that was presented with more support than Paget-Brown won votes at local election – he won just over 1,100 votes to secure his mandate to ignore us completely. And ignore us he did. The debate took place in the Council chamber, with FNKL watching incredulously while Councillors stared at their smartphones as our representative made his statement. Paget-Brown himself, having made no reference to our submitted prayer in debate, accused us of ‘crude class warfare’, and wondered aloud if we were ‘making a quaint heritage point’. Clearly, he had failed to read the prayer of the petition and ignored the numerous public platforms from which we had repeated our arguments about democracy, public process, and the use of public assets. To be fair to him (though he was never so fair to us), he was not the only Councillor in that ‘debate’ who had failed even to read the terms of the petition we presented. The petition was ignored in its substance then, and also formally - to this day, FNKL have had no response to the petition in line with the Council’s policy on petitionsi despite numerous exchanges with the borough’s Head of Governance since, who has repeatedly promised, but failed to produce, a response to the petition’s prayer. Neither has there been a response to FNKL’s second petition, presented July 2017. This was a Council that didn’t even bother to pretend to consider the concerns of residents, even when those concerns were raised through the appropriate channels supposedly provided by the Council to enable resident engagement. Therefore, it is not hard to take objection to O’Hagan’s insistence that there is ‘no evidence’ of anything amiss in the Council’s attitude to ‘the poor people of North Kensington generally’. FNKL have email trails, numerous public meetings, statements, and correspondences that we would happily have turned over, had anyone at LRB bothered to ask us, that evidence the culture of uninterest at best, and outright hostility at worst, towards our legitimate concerns about decision making processes; and a failure on any level to engage with the actual issues that we raised. This is all worth noting because it offers evidence to O’Hagan and the LRB – evidence that really should have been considered before The Tower was published – of the Council’s wilful refusal to engage with residents, which O’Hagan (or is it Nick Paget-Brown speaking through O’Hagan) is at pains to deny. But, the whole experience of FNKL is grounded by evidence that, and this bears repeating, we would happily have offered O’Hagan and the LRB, had we been asked. For example, we would have been pleased to hand over footage of Nick Paget-Brown on Portobello Road, scoffing at residents who had asked whether he thought people in North Kensington (whom he describes witheringly as ‘you people’) should be allowed to be part of decision-making processes. We would also have directed you to the Kensington Society, to whom one Councillor remarked that ‘a single, hand written letter, in cursive script’ was ‘worth 1000 petitions’. We would have reminded you that Rock Feilding-Mellen is on record stating that even if ‘every resident’ of the Silchester estate – a mix of lease holders, tenants, and social tenants – disagreed with Council plans for their homes, the plans would go ahead if the Council cabinet – a handful of Councillors, predominantly voted for by the wealthy of Chelsea and including not one single representative of North Kensington – thought it should. More succinctly and revealingly, Feilding-Mellen has stated, in relation to plans on his family’s land, that the ‘village does not dictate terms to the estate’. In addition to being casually laden with class prejudice, this last is an argument against democracy - for capital as the basis for suffrage. In Rock Feilding-Mellen’s world, people should only have a say in their lives if they are wealthy, however many villagers there are and however few the Lords. Other Councillors might consider your arguments if you write with handwriting that they like, that looks like it has come from PLU, because they owe nothing to democracy or justice, they just listen to people they like. The Leader of the Council, however, did not even believe us to be capable, rational human beings, able to make decisions for ourselves. In these examples, democratic principles were not just ignored, but openly mocked. The idea of self-determination, of the dignity of agency – openly mocked by Councillors charged with democratic representation. Feilding-Mellen was a particular bane to the library campaign for a number of – again – publicly available reasons. According to O’Hagan: ‘They [the activists] accused Feilding-Mellen of supporting the scheme because his children’s names were down for the prep school that was making a bid for the old library building. But the deputy leader had his children’s names down for all the local prep schools and there was no benefit for him in conspiring over it, and no evidence that he did’. This is, at best, an interesting interpretation of a single fact – that Feilding-Mellen had his kid’s names down for more than one private school. However, an afternoon’s reading on the publicly available material about the library campaign – let alone a single conversation with someone from the campaign - would have produced a very different paragraph. For example, Feilding-Mellen didn’t only support the scheme, he designed it. He was cabinet member in charge of property, and architect of the ‘sweat-the-assets’ approach of the Council, an approach openly acknowledged by Kim Taylor-Smith, the current Deputy Leader of the Council, to a meeting of FNKL after the fire. Under Feilding-Mellen’s charge, officers from the Council approached Notting Hill Preparatory School (NHPS) Ltd, who occupy the neighbouring building to the Library, in 2014, and offered the library building for lease. The idea was to move and consolidate library services to a new building - the current building had separate children’s and reference libraries, a computer room and meeting rooms. The proposed ‘new library’ was in fact a single room in a three-story building. This new building was being built predominantly to lease to the Alpha Plus Group that run Chepstow house – another private business who have already consumed a beloved local asset, the Issac Newton school. (Chepstow House, coincidentally and since O’Hagan brought it up, were the other prep school for which Feilding-Mellen had his kids’ names down, and it was again under his charge that they were allowed to expand into the previously state held Issac Newton School). Obviously, describing this building as ‘a new library’ made the Council’s investment in building privately leased assets, to facilitate the expansion of private schools, somewhat more palatable. The meeting in which this was decided was conducted in September 2014, almost a full year before the Council moved to make the process transparent, according to then Town Clerk, Nicholas Holgatei (although Holgate’s standard for transparency is low – initial presentations were made during confidential, i.e. not public, Council meetings), and two years before any viability study for the future of the building was conductedii. The minutes of the meeting were obtained by the Grenfell Action Group (GAG) under FOI and are available on their websiteiii. The deal for the library was done and dusted behind closed doors, in a manner that caused grave concern at the Housing and Property Scrutiny Committee on 6th January 2016, who moved to ‘call in’ the decision for scrutinyiv, but were unable to scrutinise the decision, so Holgate informed GAG, because the matter was settled before it came to the attention of the Committee. Contrary to O’Hagan’s article, then, there was no ‘bid’ made for the building by NHPS Ltd; it was offered to them in a private meeting orchestrated by Rock Feilding-Mellen. From FNKL’s point of view, that this was done behind closed doors; and completed before it could be subject to scrutiny means that it did indeed look a bit like the Cabinet member for Property ‘conspired’ to ensure that we users of the library building had no say in its future. The financial arguments offered for this at the time - and mindlessly repeated and inflated by O’Hagan (who claims it would bring in £1million a year) did not make sense of or justify the loss of the building then, and they do not now. In the first place, the numbers did not add up. The building was to be leased to NHPS Ltd for £365k a year, but with two crucial caveats: first, the Council would remain liable for the upkeep of the Grade Two listed exterior. While housing library services, the Council was free to take a low maintenance approach to this but it is likely that their new tenant would require a higher standard of upkeep, driving up costs associated with the building (while keeping it out of public use). The second caveat was a full year’s discount – which is quite a deal – taking down the overall value of the lease. Therefore, the cost of the new building (widely thought to be £11m at the time but acknowledged to be more like £18m by the time of the fire) would not be covered by the lease of the old library to NHPS Ltd. In the second place, the income for the new building was not an argument for removing library services from the old – the new building was predominantly designed for lease to private schools in the area and the leasable area could easily have included the area earmarked for library services, leaving library services in the original building. Of course, there would have been difficulties with this latter suggestion, which some in FNKL made at the time. Such a move would have made starkly apparent the issue that the whole scheme was in effect the Council loaning private businesses £18m to build a new building, and offering them publicly owned space for their expansion. Facilitating the expansion of private businesses at the cost of taxpayers doesn’t look great from any angle, but the Council tried to mitigate this by talking up the fact that the businesses were (private) schools. Additionally, by offering only the leaseable space in the new building to NHPS Ltd, the Council would be forced to acknowledge that the space offered library services in the new building was substantially less than was available (although not fully used) at the old building – merely leasing the new building, then, may not have fully covered the cost of building it at all. This issue of the new ‘library’ being smaller than the original is one that they had been unwilling to acknowledge publicly, shamelessly massaging figures to deny the reality that moving library services to the new building would effect a loss of overall available space and facilities to all the users of the library, who were now expected to rub along nicely in one room – study, reference, reading, computers and rhyme-time all one big happy family. FNKL’s focus was, as stated above, on keeping the original library building available for public use. However, we felt that the loss both of space and of specialised services was at detriment to library services as a whole, and took up this issue as a secondary part of our campaign. In this context, we wonder on what grounds O’Hagan felt able to state that Paget-Brown ‘never closed a library without proposing a better one to replace it’. The view that this new scheme was an improvement on existing library services was not shared by users, local minority party councillors, or anyone publicly, save Nick Paget-Brown. The majority of users and respondents to a survey put out hastily to – in the words of one Council officer – carpet bomb the area into agreement – stated that they were against the scheme and thought it wasn’t an improvement. O’Hagan’s line seems once again to have come straight from Paget-Brown. As does the suggestion that activists ‘never mentioned the new library when talking about the old’. But FNKL did – patiently, endlessly - discuss the new building (given that its use was predominantly for private schools, it seems a stretch to call that proposed building a ‘library’). We mentioned it in campaign materials, correspondence, public statements, and are on the public register at the planning meeting for that building (during which, for the record, at least one Councillor seemed to be more or less asleep). To our eyes, the new building was an investment of public money in private businesses, and for that reason, even in RBKC, the scheme could not go forward without the fig leaf involvement of library services (to their detriment). However, the scheme’s principle beneficiaries were two private schools - you know, ones where Rock Feilding-Mellen wanted to send his kids. But for us, debating whether this was a ‘conspiracy’ of Feilding-Mellen’s is by the by – our campaign and the Council’s response to it is a matter of public record. When we as the Library campaigners have argued that decisions were taken behind closed doors, without scrutiny or consultation, we are merely stating facts that O’Hagan has declined to investigate, acknowledge or address in his dismissal of our campaign. Feilding-Mellen was the author of this situation and the Cabinet member with the brief for property. Paget-Brown was its chief apologist, a man who to this day has refused to acknowledge to any arguments that campaigners made, responding only in contexts where his constant sleights-of-hand would go unchallenged. He was - and it seems, still is - unapologetic in his view that the people - you people, us villagers of North Kensington - lacked the capacity to make decisions for ourselves. He prefers instead to confect an argument that he can win and a narrative where he is the victim – is this possibly the most offensive aspect of O’Hagan’s article about the needless deaths of 72 people? These are the people O’Hagan and the LRB have thrown their lot in with - fine, you are free to take up whatever relationships and causes you see fit. But it is disingenuous, if not outright fraudulent, to present this current pet project – the defence of people openly opposed to democratic processes – as anything other than partisan, partial and at best based on incomplete research. This is not investigative journalism, it is PR for rightfully discredited politicians. O’Hagan’s account is merely an apology for why to this day, none of those Councillors involved in governance of North Kensington think they have anything to answer for. It makes no attempt to challenge this sociopathic, self-serving position in which somehow the real victims here are Nick Paget-Brown and all the poor Councillors tucked up safely in their own beds, in their own houses tonight. Well, at least now we know: Nick Paget-Brown, head of the Council that oversaw the Grenfell Tower fire has no regrets, and is still offering a factually incorrect account of his interactions with the people of North Kensington. FNKL can only hope that when his testimony is offered at the Inquiry, he is not given a free pass by some fiction writer who is determined to write a romance about men with fogeyish manners instead of conducting a robust investigation. We look forward to reading your corrections regarding FNKL and hearing your apology for throwing this particular grenade at our community at this time. We rather hope that Andrew O’Hagan is not given free reign to patronise us in response, as he has done Melody Mole and others, and instead is held to account for his poorly executed ‘research’. Please consider that we have had to put this response together in our spare time, while holding down jobs and holding up each other through the crisis of the inquiry and anniversary, the difficulty of which your publication has exacerbated. We do not have your resources in relation to this piece, financially or emotionally; we do not have the time that you and your researchers do. We therefore think it insulting that – again – we have to mobilise just to get facts on the record, and are – frankly – amazed that this piece passed the editorial process. We can’t help wondering who thought Andrew O’Hagan was the right person for this job in the first place. Shouldn’t you have given it to a real journalist.